Of all the days of the week, I think Fridays are my favourite cooking days. I cook something every day, but during the week it is often rushed, and not as enjoyable as it can be when I can take my time to really embrace the whole process. I love buying fresh produce, loading my kitchen benchtop with the ingredients I'm going to use, rolling up my sleeves and getting to work. What I love about making salads is that I'm using the fresh colourful ingredients, and I think Damien Pignolet said it so well in his latest book: "Composing any dish (...) calls for understanding of what constitutes balance". Pignolet refers cooking to composing classical music, because "the instruments employed by a cook in creating a dish are the chosen raw material woven into balance as governed by our sense of taste." This particular salad is not by Pignolet, although I am sure to cook many recipes from his wonderful new book Salades. What I love about this strawberry salad is that it incorporates the salty chewy halloumi with the sweet strawberries. It's work of a genius (actually by Jamie Oliver), and I can definitely sense the balance of flavours Pignolet was refering to. In a bowl, drizzle the strawberries with a tablespoon of balsamic vinegar, a squeeze of lemon juice and a tablespoon of extra virgin olive oil. Season with sea salt and pepper. Heat a tablespoon of olive oil in a frying pan and pan fry the halloumi slices on both sides until golden brown (about 1-2 minutes per side should do). 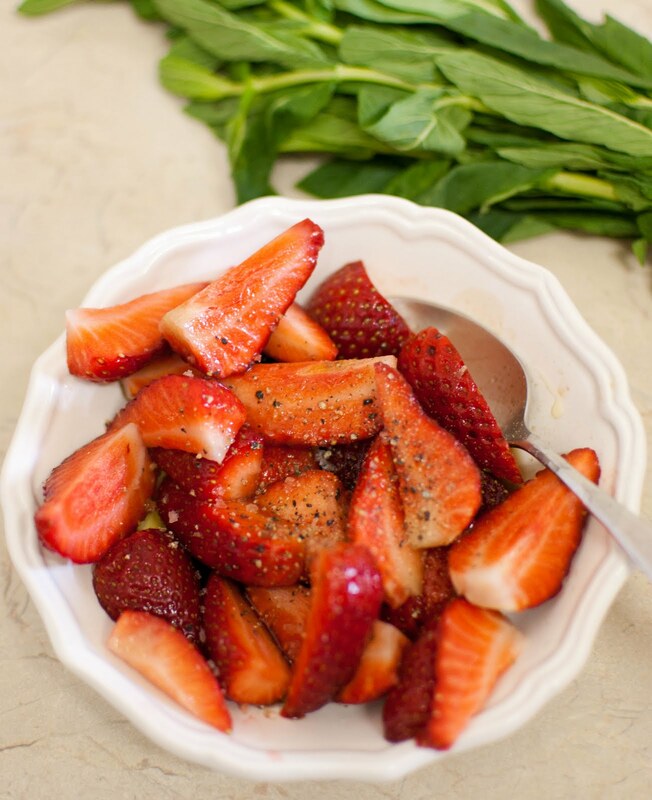 Combine the salad leaves and the mint with the balsamic strawberries and toss well to combine. 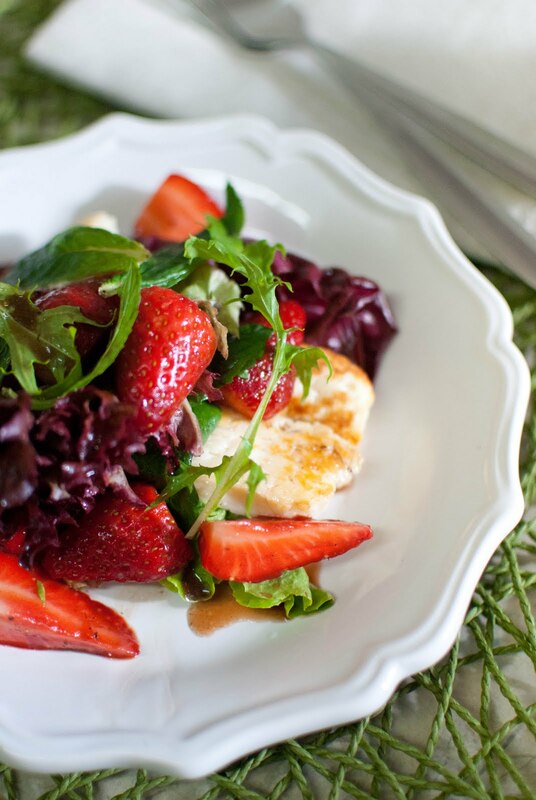 Place the halloumi slices on plates, top with some salad and strawberries and drizzle with the remaining dressing. oh my. what a beautiful combination. went straight to my foodgwaker favourites and a must try for when strawberries are available again. A very beautiful and delicious fruity salad! I wouldn't have thought about pairing strawberries with haloumi but I do like the both of them! Wow Maria! Your photography is amazing. And the recipes look delicious. I'll be stopping by often! I love Halloumi, but until now have not been able to purchase it here in Spain. So lucky me I'll now be able to make this recipe. Oh,the thought of teeth sweaking halloumi cheese pared with strawberrys, awesome. Thanks for sharing. Halloumi is one of our favorite cheeses and I bet it's amazing in this salad! I also love the addition of mint for a bit of freshness...delicious! 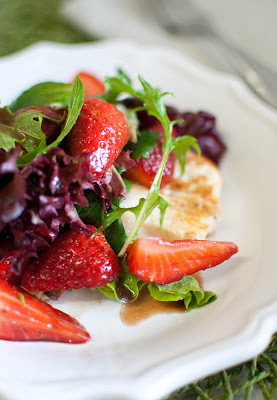 I love love love Halloumi, I wouldn't have thought of putting it with strawbs but this looks like such a yummy salad!! Love this simple and hearty salad. Another one of your beauties Maria! Would love some now to cool me down. Greetings from Kuala Lumpur! 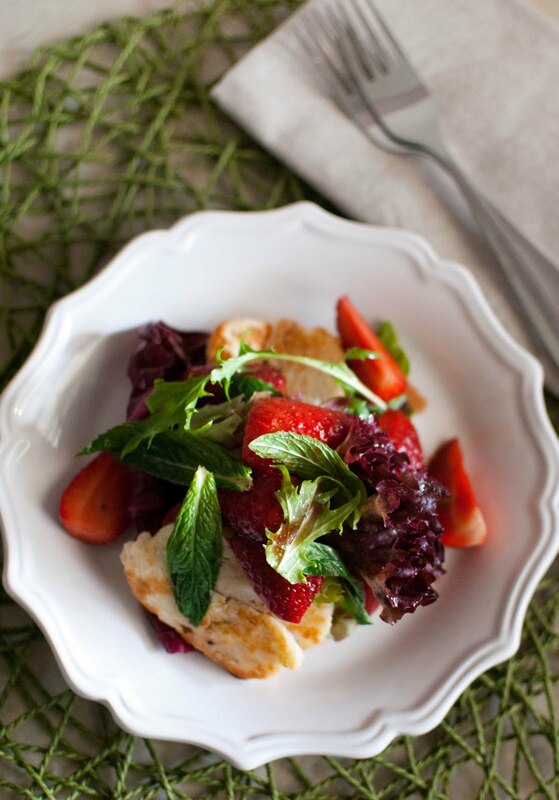 I love INTERESTING salads and with the halloumi and strawberry...this certainly qualifies. What a great balance of flavors you've achieved here! i have the biggest crush on damien pignolet's new book but must agree, maybe not the most practical and easiest recipes to make. loving the look this salad and who would've though, halloumi and strawberries! This is a lovely salad, Maria! Just wondering - if I can't get halloumi cheese here, what other cheeses will fry out nicely? Maybe I can substitute with tofu? Thanks so much for this recipe and the beautiful images. I've made it twice and the second time I put a few drops of liquid stevia, for extra sweetness. So delicious. Hi Maria, just wanted to let you know I tried this recipe. Very impressed, thanks.